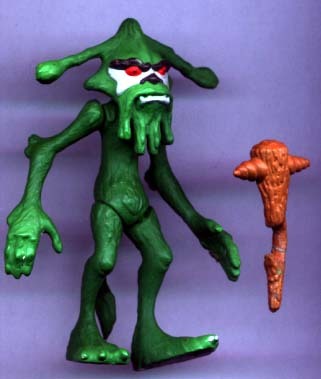 Here you see a fully-painted hardcopy of the Dulok Scout figure from the short-lived Ewoks line. It's quite nice that this piece includes the weapon. With the scattered body parts and purple background, this image almost looks surreal! But it also illustrates one of the important characteristics of hardcopy figures: their limbs are attached via pins. This photo emphasizes another quality of hardcopies: they lack mold details such as dates and foot holes. As you can see from this last image, no foot holes in this bad boy.